Love word games? Boggle or Scrabble, it doesn’t matter – as long as you are able to gain a whole boatload of points to have your opponent submit to you by your sheer word power alone. Well, here is a modern take of a classic word game, Scrabble. We’re talking about the Scrabble Electronic Scramble, which is actually a different kind of game type as you are given an allowance of only 75 seconds to come up with as many anagrams as your brain can crack, using nothing bit the letter tiles which automatically recognize words. 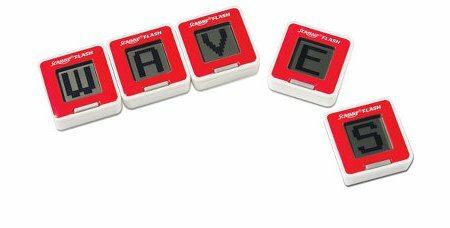 Needless to say, speed is of the essence here, where the five 2″ electronic tiles are smart enough to sense their relative positions when placed next to one another, and they will beep and flash whenever they detect any approved three-, four-, or five-letter word. If you love flying solo, then you will challenge yourself by forming as many five-letter words from the same letters or random letters, while the third mode will require the tiles be passed from player to player in order to form words in a limited time so that one avoids getting eliminated. Nice to know each $29.95 purchase comes with five CR2032 batteries to get you started right out of the box.